Gift shops in the Maldives are usually of two extremes – very basic, not too impressive souvenirs (coconut shell turtles), snacks (Pringles and Tobblerones) and toiletries or over-the-top luxury fashion and jewellery. Resorts that (a) don’t exploit the opportunity for effective cross-sell, and (b) don’t equip better for the things I might actually want to buy are a bit of a pet peeve for me. I’ve found a few fine establishments, but more often than not I am left wanting. 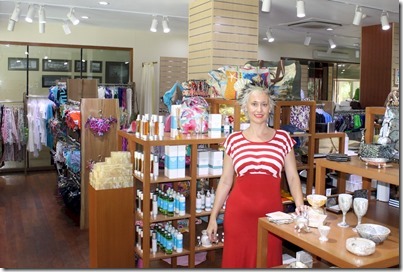 The one resort retailer that does stand out is Kurumba’s Nala boutique. Every visit, we find something there to buy. Our latest visit, it was not just one, but two items that we had failed to find during our entire 10 resort tour. Lori had misplaced her USB cable to attach her GoPro to her computer. Needed for both charging the camera and downloading the photos, we had been borrowing these little chords (of which we have about a dozen kicking about in our cable drawer at home) throughout our trip, but for the life of us could not find one to buy. Until we arrived at Kurumba which had one for sale. On top of that, this trip was Lori’s first go at her new GoPro and the incompetent dive shop in North Carolina which sold it to her (as well as the very expensive underwater light) neglected to advise her to get a basic $30 red filter for enhancing underwater shooting. Those too were nowhere to be found…until we came to Nala which has a whole line of GoPro accessories. It’s not just the practical, gadgetry where Nala excels, but fashion too. I’ve already penned a post about their signature burkini. Lori has bought a number of wraps and tops there, and the only jewellery I ever bought in the Maldives was at Nala (a pair of lovely round enamel earrings with the Maldives azures and turquoises). You can also find some properly distinctive mementos and gifts to bring home. One of my favourites is the line of coconut products. Coconut is the zeitgeist of Kurumba, and as I have written, Kurumba even produces its own coconut oil which it uses in everything from cooking to the toiletries at your villa. And if you want to bring home a bit of Maldives essence, then you can purchase these same products and even the coconut oil itself at the shop. 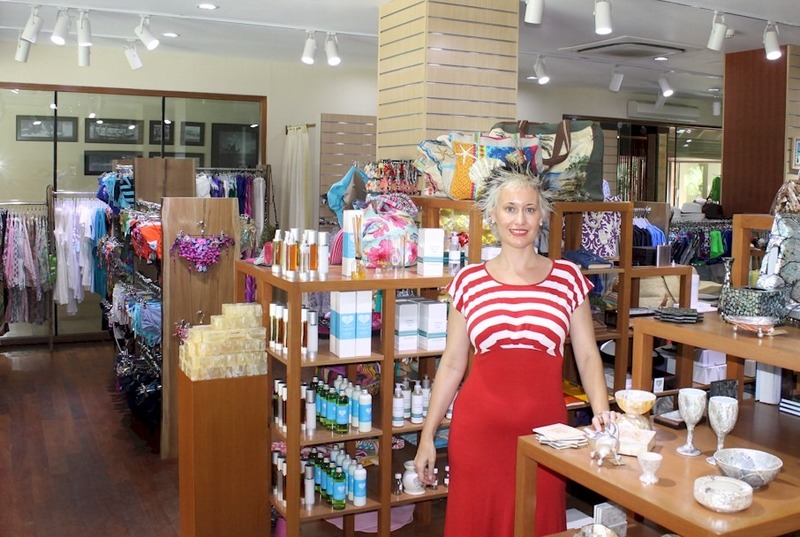 Most gift shops are pedestrian “phone it in” affairs, but Kurumba’s is an entrepreneurial inspiration by the manager Victoria Kruse (see above…wife of the resort GM). She scrutinizes the fashion range, introduces inventive products like the burkini and the resort-made coconut oil and makes sure that it caters to what people really need and want.